Libya, Saudi Arabia and Egypt have in recent years taken up the cause of the Moslem rebels in the Philippines; their role in this conflict provides striking parallels to the part of Arab states in the struggle between Israel and the Palestinian Liberation Organization. The current Moslem rebellion has its origins in the mid-16th century, when the rapid Spanish conquest of the Philippines met strong resistance in the southern islands, those inhabited by Moslems (called Moros, after the Moslems of Spain). For three centuries, the Spanish government in the north tried to control the Moros, with little success; The United States did accomplish this in 1915, but even then not completely. And since independence in 1946, the Moros remain alienated from mainstream Christian Filipino society; to express their grievance, they began a rebellion in 1969 to achieve independence or, at a minimum, autonomy. The Moros caught the eye of Libya's leader, Colonel Mu'ammar al-Gaddafi, in October 1971 when he accused the Philippine government of a "studied, deliberate plan" to exterminate the Moros. In March 1972 he brought their plight to the attention of the Islamic Conference, the international political organization of Moslem states. In June 1972, Gaddafi offered to send "money, arms and volunteers" to the Moros, an announcement which alarmed the government in Manila. 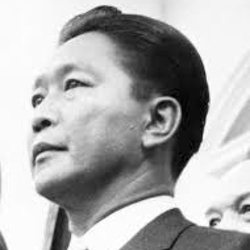 President Ferdinand Marcos of the Philippines. In response, Philippine President Ferdinand Marcos made the first of two fateful decisions; hoping that economic and social reforms undertaken by his government for the Moslems would impress Gaddafi and convince him not to meddle, Marcos invited a delegation of Arab officials to visit the Philippines arid inspect the situation at first hand. At this time Marcos was innocent of Arab politics; he did not realize what it meant to open the door to Libya. He accepted mediation by the Arabs despite their clear predisposition in the Moros' favour and his own conviction that the problem in the south could only be solved within a domestic Filipino context. But Marcos feared that refusing the Arabs a role would lead to an oil embargo (the Middle East supplies 80% of the Philippines' oil), exclusion from their financial markets, their enmity in international forums, and increased aid to the rebels. An Arab delegation visited in July 1972 and announced, before leaving the Philippines, that although some local officials supported violence against Moslems, it found no evidence of systematic persecution. Such a mild conclusion was ill-suited to Libyan purposes, however, so the final report strongly condemned the Philippine government. As one Libyan member of the delegation summed it up: "We believe the conflict is now a religious war." A few months later, armed largely by Libya, the first major Moro attack occurred, in October 1972. 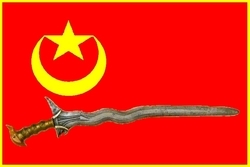 The Moro National Liberation Front's flag. Shortly after, Tripoli became the headquarters for the Moro National Liberation Front (MNLF), the leading Moro organization; other groups later worked out of Cairo and Jidda. Although militarily much stronger than the PLO, these groups could not stand up to the Philippine army, and relied heavily on terrorism: arson, kidnapping, assassination, road-mining and truck-hijacking occurred frequently. MNLF members robbed Christians and Moslems alike so often that some considered them bandits rather than guerrillas. A new round of diplomacy began in March 1973 when the Islamic Conference appointed another mission to visit the Philippines and make recommendations. Reporting back to the next Islamic Conference meeting in June 1974, it called for talks between the Manila government and the MNLF. Although reluctant to confer official status on a terrorist group by negotiating with it, Marcos made a second momentous decision when he did agree to enter into discussions with the MNLF. Marcos' flexibility appeared to pay off in December 1976, when he signed a peace agreement with the MNLF in Tripoli. It called on the MNLF to stop fighting in return for autonomy in the south. These accords raised high hopes; yet they were dashed within months. The MNLF demanded more power than had been agreed upon, the ceasefire broke down, and fighting resumed. Marcos then changed his strategy, and lured the rebels out of the jungles by spending more money on the Moslems. Although these programmes succeeded in cutting the size of rebel armies by two-thirds, the Islamic Conference, Libya, and the MNLF refuse to acknowledge them, and the war goes on to this day. All these parties also insist on the MNLF as the only legitimate representative of the Moros and reject any of the Moro spokesmen based on the Philippines. In this and other ways the MNLF resembles the PLO: both are terrorist organizations which receive funds, arms and significant international backing from powerful Arab states. Unlike Israel, however the Philippine government tried to defuse its conflict by granting the Arab states a mediating role and by recognizing the MNLF. As President Marcos would be the first to agree, these steps were a mistake. Dr. Pipes, who teaches history at the University of Chicago, is writing a book on the role of Islam in current politics.